A woman who seriously injured a teenager when she crashed into a bus stop while on a cocktail of drugs, has been given a suspended sentence. Julie Wilson, 37, had previously pleaded guilty to causing serious injury by dangerous driving and driving under the influence of drugs. Truro Crown Court heard she had not slept for five days before the crash. 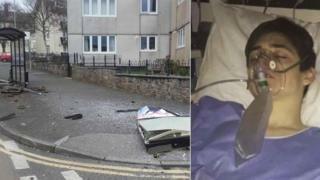 Josh Ladd, 17, is still recovering from major injuries and described the sentence as "too lenient". He sustained leg and collarbone fractures, a punctured lung and has had to have counselling to combat anxiety. Speaking outside Truro Crown Court, he said: "It's outrageous and doesn't set a good example." "The fact she got away with no custodial sentence is just wrong," he added. Wilson had only driven a few hundred metres from her home in Penzance when she fell asleep at the wheel, the court was told. She had taken cocaine, heroin, methadone, morphine and codeine in the days leading up to 13 March, as she was afraid to sleep because of threats from a violent drugs gang. Hospital tests showed the level of cocaine in her system was so high it went above the recognised scale. Judge Robert Linford described the circumstances as "unusual" and said he gave a suspended sentence "with a very high degree of hesitation". He said Wilson, of St Clare Street, Penzance, was the victim of "sinister threats" and had taken the drugs in order to remain "awake and alert" to the possibility of her home being "invaded" and "subject to attack." Paul Gallagher, for the defence, accepted Wilson was "off her face on drugs to the extent she fell asleep at the wheel" but explained a drugs gang had been making threats after her partner found a bag of drugs and she handed it in to police. Weeks later her partner was stabbed multiple times. Wilson was given a two-year sentence, suspended for two years. She was also ordered to carry out 200 hours of unpaid community work, 25 days of drug rehabilitation and to live under a curfew for three months.